Almond butter, almond flour, shredded coconut, and pumpkin combine in these positively scrumptious, beautiful and healthy gluten-free and dairy-free muffins — perfect for autumn, or any time of year! Free of refined sugars, too! You just can't go wrong. . .
And, while a part of me is sad to see that my little baby boy is now a full fledged toddler, I'm simultaneously over-joyed with his newfound sense of confident exploration; and I greatly look forward to our autumn adventures. Some of those adventures will no doubt take place in the kitchen, as I continue the never ending journey of trying to introduce new foods with various textures and flavors that my little one will (hopefully) enjoy. The thing that strikes me most about these muffins is their amazing flavor. Pumpkin, almond, and coconut truly combine well, my friends. 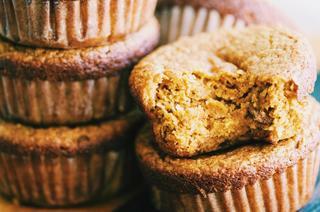 Throw in their lovely light and fluffy texture, and you get some positively scrumptious muffins! They make a perfect autumn treat; and if my family is any example, they will not last long once pulled out of the oven! I hope you enjoy these tasty delights as much as we do, and I wish you all a very happy & joyful autumn! Preheat oven to 350° F. Grease or line a muffin tin with liners, set aside.In a large mixing bowl combine pumpkin, eggs, maple syrup, milk, almond butter and vanilla. Whisk until smooth.Slowly stir in remaining ingredients and mix until well combined.Pour muffin batter into your tin or liners until about 3/4 full.Bake muffins for 24-27 minutes, or until firm and a toothpick inserted in center comes out clean. If making 12 standard (smaller) muffins, check muffins at 18 minutes.Let cool for 10 minutes before serving.Enjoy!